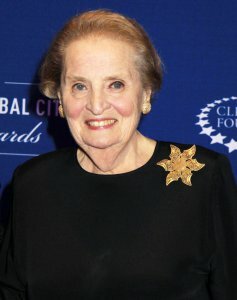 I had the opportunity to meet the former Secretary of State Madeleine Albright last week. The experience made me realize that I’ve taken the opportunities paved by generations of women before me for granted. To Dr. Albright, the grandmother I never knew, and the women and supportive men of generations before me, please accept my apology. This letter that I wrote to Dr. Albright is also a letter to you. I believe that people come into our lives at the exact moment we need them. I believe that has happened with you. This week, a woman who has mentored me my entire life told me that although she has struggled to admit it, she realized she was not ready for a woman president. This was the first time I realized that this strong, independent, educated woman — who I thought had raised me to believe that I could do anything my brother could do — did not in fact believe that this was true. The next morning, I was listening to an interview in preparation for meeting you. In the interview, you said you thought that many women of my generation took our opportunities for granted. Sadly, I realized that until hearing my mentor express this, I was one of those women. I never had the chance to meet my grandmother, but you remind me of the woman I’ve always imagined her to be. As a sincere apology for taking my opportunities for granted, I’d like to share the story of the granddaughter my grandmother never had the chance to meet. My name is Elizabeth Kraus, and I was named after my grandmother Elizabeth. I was born to her son John who raised me to believe I could be anything my brother could be. I grew up in the home her father built. My mother watched us grow along the marks my grandmother had made to chart the growth of her children. My mother always imagined I would chart my children’s growth in the same home, but I knew from a young age that the world had other plans for me. I always wondered whether the world was ready for the woman my grandmother wanted to be, but I am eternally grateful that I’ve grown up in a world in which I can be anything I’d like to be. As one of the few students in my graduating class to leave my home state of Michigan, I ventured to the University of Colorado without knowing a soul there. I learned how to make a name for myself in a town and school where I was just a number. At the age of 24, I started my first business with some of the money my grandmother had left for my father, who in turn invested in me. I took the lessons I had learned as an entrepreneur and some of the money I had inherited from my father’s success (which was financed in part by my grandmother), and I started investing in other entrepreneurs. I then took the lessons I had learned as an investor to co-found an accelerator and fund to invest in female entrepreneurs. I am extraordinarily proud and grateful for the success I’ve achieved with the help of the money my grandmother left to fuel the generations after her. I am even more grateful for the path for women that was paved by my grandmother and by generations of women like you, Dr. Albright. I have felt so unconstrained by my gender that I nearly turned down the opportunity to co-found MergeLane, an accelerator and fund for high-growth startups with at least one woman in leadership. Luckily my business partner, a former federal prosecutor, used her gift of persuasion to help me see that investing in women is not just the right thing to, but the smart thing to do. Since launching our accelerator and fund two years ago, we’ve oversubscribed every investment fund we’ve opened and oversold every event we’ve planned. Our funds have invested in 26 extraordinary companies led by extraordinary women. Our startup accelerator has outpaced some of the leading programs in the world. To date, our 18 accelerator graduates have raised $20.2 million in funding and have created 231 jobs, including 38 leadership roles for women. Most gratifying, I’ve been able to see how many people believe that investing in women is in fact that smart thing to do. You have made this possible, Dr. Albright. For this, I am eternally grateful, and I promise never to take this for granted again. Until this morning, I was going to stop the letter here. However, in that same interview, you expressed the importance of speaking up and asking for support from other women. I woke up this morning and decided to be brave and go a step further. This week was the first time I’ve taken the opportunity to learn about you. I now have tremendous respect for the greatness you have achieved against insurmountable odds. Perhaps more importantly, I admire the way you deliver an educated, powerful message by exuding credibility, morality, and authenticity. This is something to which I have always aspired. I can imagine nothing I would like more than to invite you to join our journey at MergeLane. To build on the success we’ve achieved, we’re launching a new initiative. Dr. Albright, will you join us to invest in this initiative? If you can send your contact information to Elizabeth@mergelane.com, I can share the details. I would welcome the opportunity to come to Washington to meet you, to meet with you in Boulder, or to send you further information. Dr. Albright, again, thank you. Thank you for enabling the life I’ve had and inspiring the bravery to make this request.